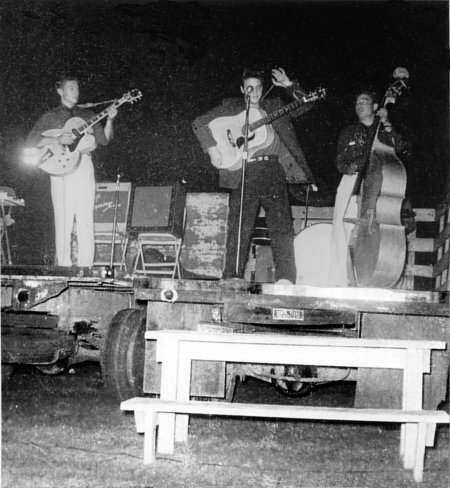 Sometime after the 21st of June 1955 (at least) but by early July Elvis replaced his 1942 Martin D-18 for a Martin D-28 (believed to be a 55 or 54) purchased at the O.K. Houck Piano Co. in Memphis. Sid Lapworth, who sold it to him seems to think it may have been a used instrument and can not be certain if he took the D-18 in trade for it*. At the time, a D-28 sold new for $210, this one would have sold for less than that used. One of the earliest pictures of him with it is at the Joy Drive-In in Minden, LA in mid July. 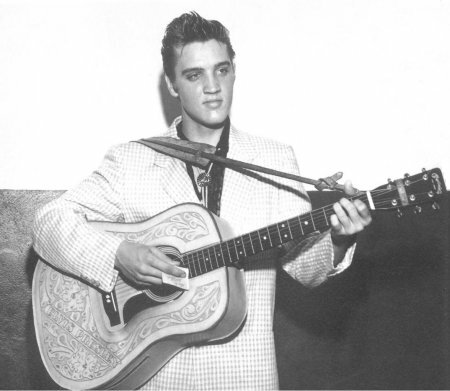 Not long after the purchase of this guitar, he also received and began using a custom made tooled leather cover with his name "Elvis Presley" blazoned across the front. According to Jimmy Rodgers Snow, Elvis had seen the one that his father, Hank Snow had and liked it. Hank had his made by a prisoner years earlier. Elvis' leather cover was made by Marcus Van Story in the basement of O.K. Houck's where he worked occasionally in the piano repair shop. One of the most famous pictures of Elvis with it and the leather cover was taken on July 31st in Tampa, Florida by William V, "Red" Robertson and has become known as the "Tonsil photo." 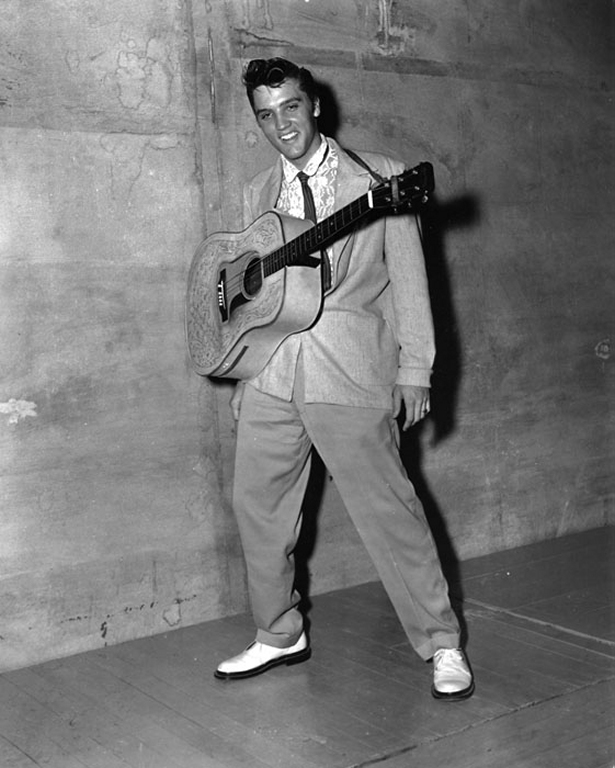 Scotty has said that Elvis used this guitar most for performing and recording until he got the J200 in October of 56. Though he began using the J200 in October, he used the D28 on occasion at least as late as November 25, 1956. 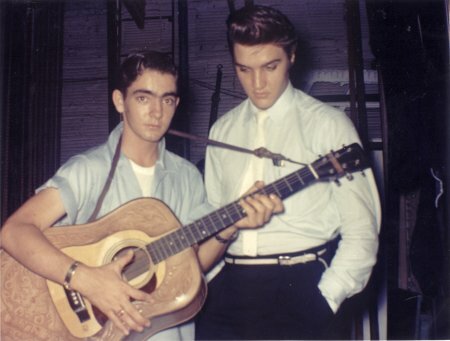 Sometime during the week between August 13th and 20th in 1955 Elvis had the opening of the leather cover trimmed back, possibly by Marcus, probably as a result of interference with his strumming. 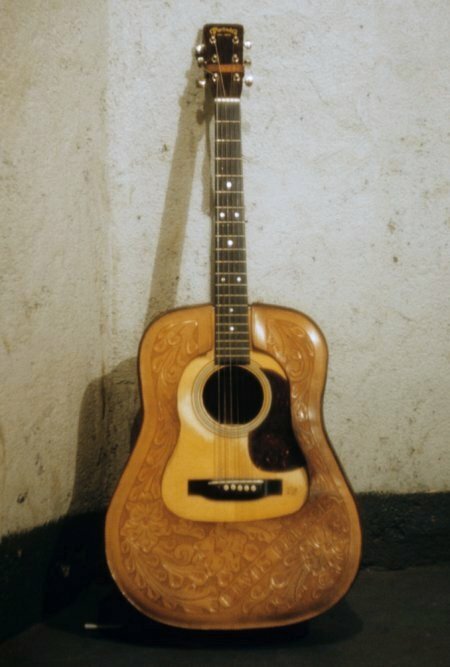 Like the D-18 that preceded it, it soon had excessive wear due to Elvis' aggressive strumming style (Note the broken strings in the "tonsil photo"). Around the time that he started using the J200, the D-28 completely dropped out of sight and remains unaccounted for to this date. 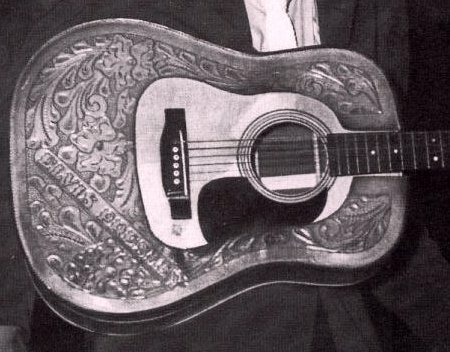 According to Jimmy Velvet however, the tooled leather cover had been in the attic of the home of Alan Fortas, Elvis' friend and bodyguard, but is believed to have been sold sometime before Alan's death and is now in Japan. Elvis' D-28 featured Kluson Super tuning machines as did many built in the 1950s. 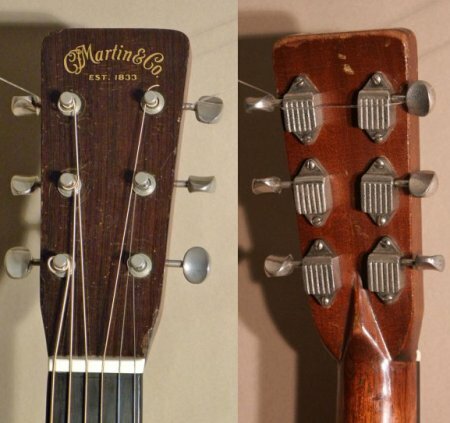 The Martin D-28 has a 40 1/2" total length, a 20" body length, 15 5/8" body width and a 4 7/8" body depth. It features a solid Mahogany neck, 20 fret Ebony fingerboard with a 25.4" scale length, solid Spruce top, Rosewood back and sides, Ebony bridge, White Boltaron® endpiece and binding, White/Black top and back inlay. 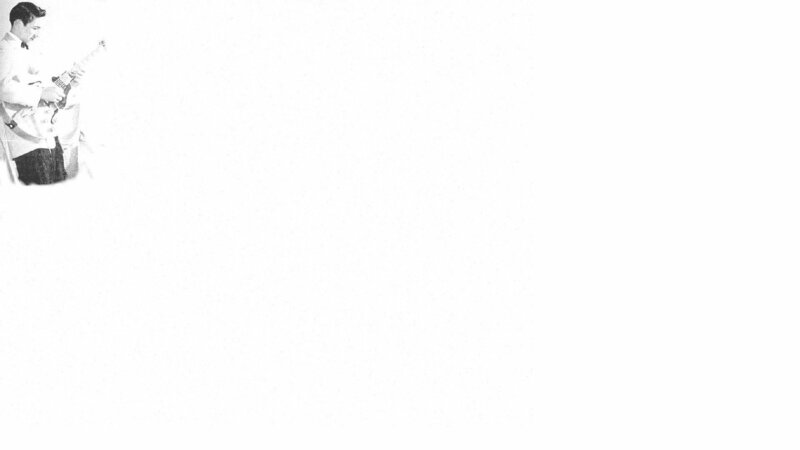 specifications courtesy C.F. 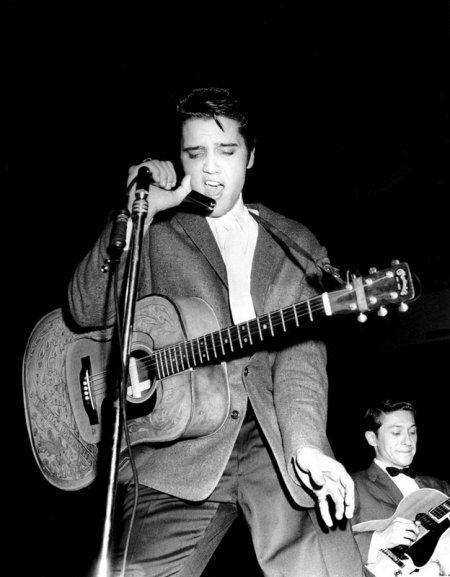 Martin Co.
*Elvis owned and traveled with a second D-18 for a time while regularly performing with his D-28. It seems to always be held on with a knotted string as a strap and identifiable by the bright spot in the pattern on the tortoise pickguard.